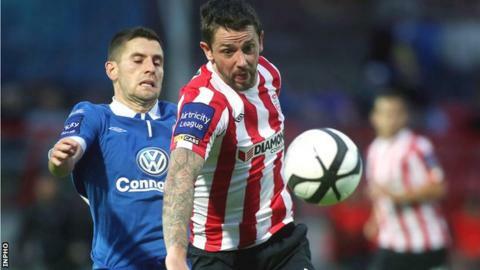 Derry City boss Roddy Collins says Rory Patterson's omission from recent matches is for football reasons only. The striker is again left out of the squad for Friday night's home Premier Division game against UCD. "He's an out-and-out finisher so I don't see any point in wasting a player in a team that hasn't created a lot of chances yet," said Collins. "I have no problem with Rory - it is not personal, it is football management and it is practical." The Candystripes have failed to score in their last two games but Collins does not believe Patterson is the solution in attack. "Rory will not be in the squad until we get the fluency in our play," added Collins. "He is a finisher, he gives nothing else - he is not a grafter and he does not hold the ball up. "When we start creating chances and we need someone to put them away, that is when Rory comes back into play. "So when that develops in our play, there will be a place for Rory in our squad." City defender Ryan McBride is an injury doubt while Barry Molloy and Barry McNamee are both ruled out. Derry sit seventh in the table and are four points ahead of the Dublin students.